How to register an Easypano Account? 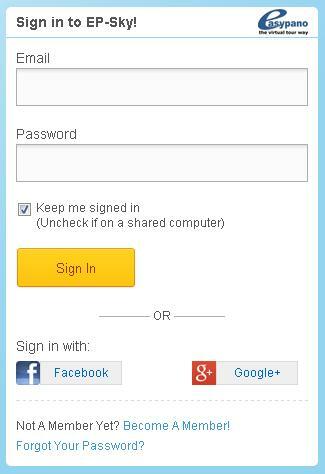 If you have already been a Easypano user, you may log in EP-Sky with your original Easypano Account and share your works, the other simple way to log in EP-Sky is to associate your social network account like facebook or Google+ account with Easypano account, which may saves your time for registration. After successfully registered an Easypano Account, you are allowed to upload and share your panoramic images, virtual tours and virtual tour elements on EP-Sky, EP-Sky allows batch uploading up to 50 panoramas at one time. Can I locate my pictures on Google Maps? Yes, Google Maps is supported and the image position and direction can be pointed, you panoramas will display as a radar on Google Maps. How to view my panorama? 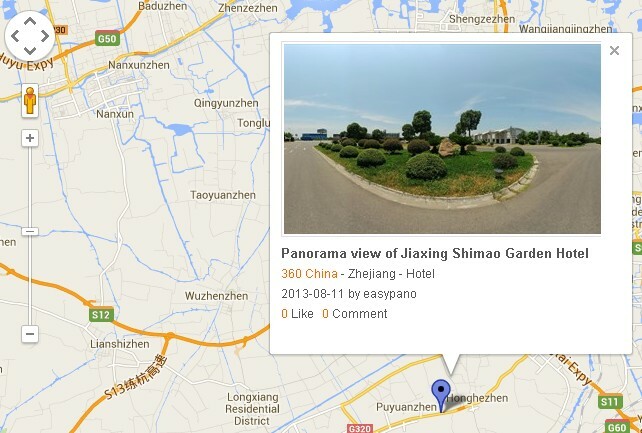 Can I view panorama and turn around on PC, iPad or iPhone( HTML5 and Flash virtual tours)? Yes, you can view and play panoramas on PC, smart phones and tablets. Because Flash formate tour are supported on PC which installed with flash player, while Html5 format tour plays automatically when you view tours on iOS and Android 4.X devices or PC without Flash player. (Safari, IE10 and Chrome browsers also support playing HTML5 format tours). The differences between HTML5 and Flash virtual tours, please refer to HTML5 and Flash virtual tour comparison chart. Click on each image or to view panoramas in 2D mode and click to view 360 degree panorama in 3D mode. You can view your uploaded panoramas and virtual tours in your Easypano account, or browse the thumbnails of your stored images under each panorama player window. How can I share my works to facebook, Google+ and Twitter? In EP-Sky, there are 3 ways to share your uploaded works to social network as facebook, Google+ and Twitter. 1) Inform your Facebook or Twitter friends about your latest works in Upload page by ticking facebook(Inform my facebook Friends) or Twitter. 2) Share panoramas on each panorama page by clicking the buttons on the left bottom of images. 3) When viewing virtual tours with your mobile phones, you may easily find the facebook or twitter button at the left corner of your screen, click on each button to share your favorite works with your friends. How to embed my uploaded virtual tour on my website and blogs? After you successfully uploaded panoramas or virtual tour, the URL of your panorama will be generated, as well as an Embed code(iframe), just copy or simply edit the width and height of iframe code, and embed it to your website or blog, it will play automatically. Why uploading panoramas and virtual tours on to EP-Sky? Each upload will receive bonus credits accordingly, these credits can be accumulated for virtual tour elements download, such as buttons, skins, or other virtual tour components, or even for products purchase or upgrade. Details please refer to EP-Sky Credits. Meanwhile, it's a way to show and share your panorama, which may save your server space. If you have no server, it's a free way to make EP-Sky as your panorama server. Faster panorama loading with multi-resolution panorama player? New EP-Sky launches latest HTML5 and Flash player which enables large images loading quick and faster. The large size images are split into many small pieces of images and loaded piece by piece on viewer, which requires less memory. 360 China is a special column held by Espanola, which contains more than 10,000 beautiful panoramic images around China, Before traveling to China, you should refer to 360 China to find your favorite scenic spots or hotels and resorts.EP-Sky is continuously update, keep an eye on it and find what you like.